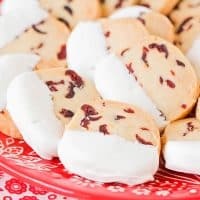 Cranberry Orange Shortbread Cookies - So rich and buttery, with the most delicious combination of flavors. They're the perfect cookie to share with friends and family this holiday season! In a large bowl or the bowl of a stand mixer, beat together the butter and powdered sugar until light and fluffy. Add the orange zest, vanilla and orange extract, and mix until combined. Add the flour, salt and cranberries. Mix to form a thick dough. Shape the dough into a log that is approximately 2 inches in diameter. Wrap in parchment or plastic wrap, and freeze thirty minutes. Near the end of the chilling time, preheat the oven to 325 and line a baking sheet with parchment or silicone. Slice the cookie dough into 1/4 inch slices, and place 1/4 inch apart on the prepared baking sheet. Bake 18-20 minutes, or until light golden brown around the edges. Remove from oven and let cool completely. After the cookies have cooled, melt the candy melts according to the package directions. Dip each cookie into the candy melts and place on a parchment lined baking sheet to cool. Store in an airtight container.